Come join Pfannenberg at "Security 2016" in Essen, Germany from September 27th to 30th - the world leading fair for security and fire prevention - where we will be introducing our latest Industrial Signaling Solutions! Find Pfannenberg at stand B38 in Hall 1.0 and discover the "3D Coverage", a practical method for demonstrating the effective performance of audible and visual signaling devices in a given space. Pfannenberg is the first to manufacture a system of this kind which offers significant improvements in planning certainty. The tradeshow will also be the venue for premiering larger, more powerful versions of the flashing lights and combined visual and audible signaling devices – PYRA L – which is part of the tried and tested PYRA product family. Furthermore, Pfannenberg will be exhibiting the PA X and PA signaling devices in the PATROL series, which are currently the only signaling devices certified for use in the maritime industry in accordance with the Marine Equipment Directive (MED). Mark Egbers, Industry Group Manager, Infrastructure at Pfannenberg, commented: "In our innovative 3D Coverage concept, we are providing the market with planning tools for signaling solutions which not only improve safety in whatever application they are used but also help to save users money because they can choose the correct products and be assured that they are correctly dimensioned. Using our solution-oriented advice to deliver more effective planning and to lower the risk of accidents, they can improve their competitiveness." For the first time, Pfannenberg's 3D Coverage uses an innovative demonstration method to visualize and compare the actual performance of signaling devices in a given space under the real environmental conditions surrounding the application and dictated by the type of alerting system. For example, it allows the coverage volume of audible signaling devices to be calculated after consideration of the ambient noise in dB(A) and the signal tone (e.g. DIN tone) and after taking the height, width and length of the space throughout which the signal is to be heard or seen. This means that parameters which go beyond the traditional information supplied on a technical data sheet can be determined. They help the staff responsible for planning the system to design and size an ideal signaling solution. 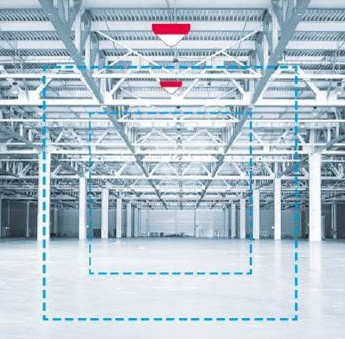 The new PYRA L flashing lights and flashing light/sounder combinations are new products in the range which offers visual and visual/audible alerting for machine safety and fire and gas alerting applications. It is suitable for use at up to 15 m and, with a sound volume of 105 dB(A) and a light intensity when flashing of up to 15 J, offering a particularly large coverage volume. Shaped in the form of a pyramid which becomes narrower towards the outsides and the top, the PYRA L fits easily into any surface contour. With powerful signalling solutions such as those in the PYRA series, users require fewer devices. Following the most recent update of the norms, Pfannenberg is currently the only manufacturer with a valid MED certificate for audible & visual and audible signaling devices. The background to this is that the European directive for marine equipment, MED, requires MED-certified signaling devices to be used for fire alerting on ships. This applies to every ship flying under an EU flag or registering or re-registering for an EU flag. Click here for more information about Pfannenberg's MED Certified devices.